Did you know as well as award winning wedding flowers and Stems letterbox flowers, we also offer a fabulous Flower school in Derbyshire. Ideally situated in the peak district, with ample parking, we are sure there is flower course suitable for you. Courses suit all levels, from beginners to professional. We are excited to have recently introduced a one to one masterclass, which enables us to create a bespoke flower school for you. So if you are looking to learn about floristry, then our flower school in Derbyshire could be right for you. Make sure you take plenty of notes! Coffee and refreshments will be available in abundance! You can book directly online with your ipad, phone or computer - what are you waiting for? Tineke floral designs are very excited to introduce our new flower school for Nottingham and Derbyshire. Would you like to attend a flower school in Nottingham and Derbyshire and learn new skills? 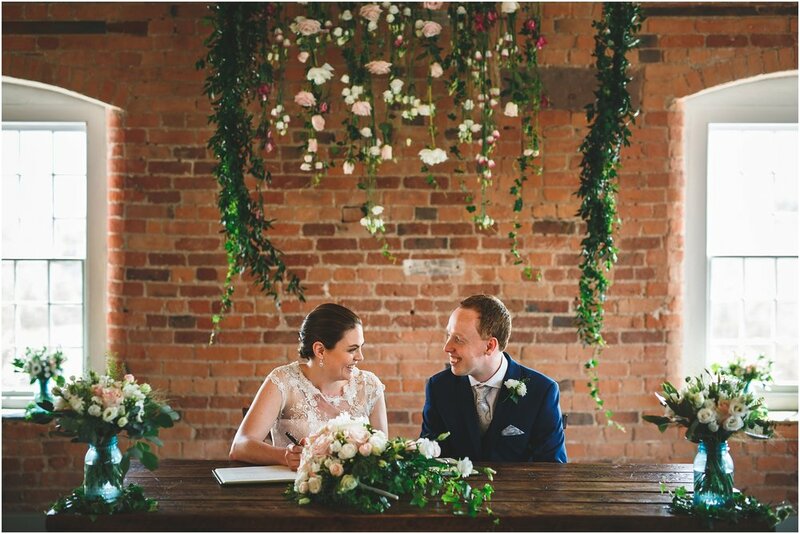 Multi award winning florist Tineke Floral Designs are looking forward to teaching students new skills including hand tied bridal bouquets, buttonholes and arrangements for weddings for Nottingham and Derbyshire. Ideal for the DIY Bride, Hen parties or just a lovely day out! Tineke's first half day class was held last Monday at Long Eaton at the fabulous Butterworth Photography's Mill, which is conveniently located in Long Eaton, with plenty of car parking and gorgeous light and airy creative space to create beautiful flowers! The day started with a chat about seasonal availability, tips for wedding flowers and coffee before proceeding to make a buttonhole. The atmosphere was fun and relaxed as Kerry demonstrated how to create the buttonhole, and Avie being available to give one to one hands on help. After this, everyone created a beautiful, wild and rustic hand tied bridal bouquet and the results were amazing! The best bit is taking the flowers home afterwards - it has been great seeing the students flowers still looking great a week on. Thank you so much to Becky at Butterworth Photography for the stunning images that she has produced, which documents the day so well. If you would like further information on courses available, please contact Kerry direct: kerry@tinekefloraldesigns.co.uk and follow the Tineke Flower School on facebook. There will be special introductory offers!